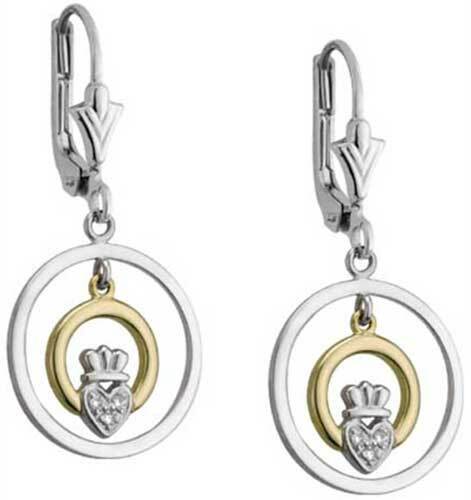 The diamond accented Claddagh floats inside of these 14K gold drop earrings. These 14K white gold circle earrings feature floating yellow gold Claddagh symbols that are enhanced with white gold along with diamonds in the hearts. The gold Claddagh earrings are a drop design on latching Eurowires and measure 5/8" wide x 1 1/4" tall, to the top of the wire. White gold necklace features a dangling yellow gold Claddagh in the center that is enhanced with a diamond heart.